A very happy and knowledgeable staff. They treated me like an individual person not just a client. Dr. PEREZ was veryconcerned o f me as a person in my normal daily life. Very comforting to know he was genuinely concerned. I will see no one else. A very happy and knowledgeable staff. They treated me like an individual person not just a client. Dr. PEREZ was very concerned o f me as a person in my normaldaily life. Very comforting to know he was genuinely concerned. I will see no one else. He was the BEST. He spent and hour talking to me about my symptoms so I fully understood and yes nowI must stop smoking...he really was the best doctor I've ever seen. He was the BEST. He spent and hour talking to me about my symptoms so I fully understood and yes now I must stop smoking...he really was the best doctor I'veever seen. 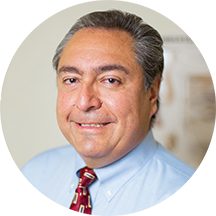 Dr. Luis Perez is an exceptionally caring Family Physician. He appreciates the challenge of diagnosing tough medical cases and does so with a compassionate and thoughtful approach. Dr. Perez received his medical degree from The University of Southern California. He treats His goal in this regard is singular: help patients get better and stay better. Very thorough I was impressed with how great his bedside manner was! His staff is EXTREMELY rude and yelled at me on the phone.